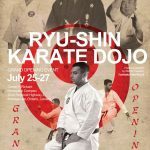 This event will be the first PREMIER LEAGUE in Japan sponsored by World Karate Federation (WFK) and managed by Japan Karatedo Federation(JKF) and will open in Okinawa on August 30 & 31,2014. We are very grateful to both the WKF and the JKF for their consideration to Okinawa as “ The Birth Place of Karate”. The Venue will be at the Okinawa Prefectural Hall of Martial Arts. The Okinawa Prefectural Government is planing to build the Karatedo Kaikan, Karate Hall (tentative name), starting this year and open it next year. The location will be in the neighboring castle ruin in Tomigusuku city, which is about 1.7 km from the current Okinawa Prefectural Hall of Martial Arts. Dear WMKA members around the world, A Happy New Year to everyone around the world. I pray for you the best in 2014 wherever you live. As we all know, we had very sad news for the past two consecutive years. They were the most severe hardships for us since the starting of the WMKA in 1960’s. To overcome this difficult situation, we have been working together hand to hand and heart to heart. 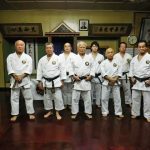 Dear WMKA Members around the world, Below is a list of the karate practice trips to Okinawa from overseas including that of mainland Japan from August to November, 2013. Dan Promotion TestsWe had four dan promotion tests; three of them were for overseas participants and one was for the annual Autumn test in Okinawa. Irish Seminar with Kiyoshi Shinjo sensei, Hanshi, 9th dan Shinjo Kiyoshi Sensei, Hanshi Kudan, travelled to Ireland from August 10th to August 17th, 2013 to present a seminar at the Dojo of Martin O’Malley in Castlebar Co. Mayo and Anthony Whelan and John Killane in Longford town, Co. Longford. 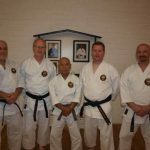 This was the first visit of a teacher from Okinawa since the sad and sudden passing of Soke Nagamine in 2012. 1. 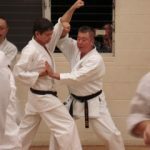 Karate-Do Seminar with Hanshi Toshimitsu Arakaki 10th dan in Australia Arakaki sensei will be teaching a karate-do seminar in Harrington Australia from October 26 to 30 (five-days) at both Mr. John Carlyle and Mr. Reece Cummings’ Dojos. 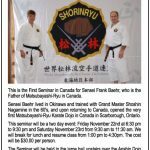 This will be his first karate-do seminar given overseas, but the second from Okinawa headquarters since the passing away of Soke T. Nagamine (refer to Shinjo sensei’s Ireland visit below). Arakaki sensei will leave Okinawa on October 25th and come back on 31st. 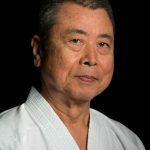 Dear WMKA members, It has been a year and a half since the passing away of Soke Takayoshi Nagamine last year. No one or anything can fill his vacancy and we are still in mourning for his loss. But we have to move forward to admire his honor and legacy. First, we want to thank for your support and cooperation in remaining and working together for the present and the future of the WMKA. As you all know, the WMKA Dojo Owner License is not a permanent license. You must renew it every year based on the Dojo Owner Agreement. If you don’t renew it, you will lose your license.